This major new profile of global health charts recent and emerging trends to show how health, poverty and human rights are inextricably linked – and how inequalities are both avoidable and unsustainable. With full-colour maps and graphics, and clear commentary, this award-winning atlas covers a wide range of topics, including: life expectancy; malnutrition and obesity; water and sanitation; cancer, heart disease and diabetes; infectious diseases, from malaria to HIV/AIDS; tobacco and alcohol use; mental health; urbanization; climate change; war, violence and abuse; avian flu and pandemic planning; antibiotic resistance. Attractive, informative, inspiring and provocative...Emerging from the colourful maps and contrasting figures, percentages, bars and pies are numerous questions of 'why, why and why?' 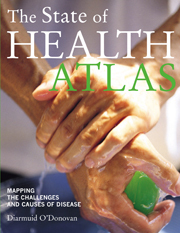 This atlas is a challenge for our concerted efforts and actions for public health, not just for our own communities, but for this endangered globe and the billions of people who are in desperate conditions. Without the use of maps, presenting this much information would be near impossible. Extremely clear and easy-to-follow, the layout is excellent...graphically illustrating the worsening health problems hitting countries like Africa and parts of Asia. 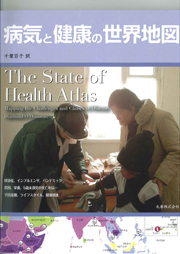 This is a superbly accessible, beautifully produced, highly informative and well-written compendium of world health statistics. It will be of interest to a wide range of professionals and students in many areas. 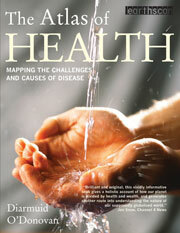 It is excellent value for money and should grace the book shelf of everyone who cares about human health. Brilliant and original, this vividly informative book gives an incredibly holistic account of how our planet is divided by health and wealth, and generates another route into understanding the nature of our supposedly globalised world.